The problem of food waste is as easy to solve, as it is to overlook. The National Resources Defense Council (NRDC) has discovered that American consumers waste 40% of food, and the goal of this campaign is two-fold: first, to raise awareness of this issue, and second, to engage consumers with actionable behavioral changes that can help end food waste. The objective of this campaign is to change behavior by first emotionally connecting the national issue to an individual’s actions. So, to truly mobilize people and create collective impact, we focused on creating awareness of the problem while infusing small inspirational reminders of actions to take at home. Fact: 40% of food ends up wasted in the US today, and nearly 25% of food waste happens in the home. Our goal is two-fold – to raise awareness, and change behaviors, on this critical yet overlooked issue in America today. Food waste has a “butterfly effect” on many aspects of our lives including – financial waste, water waste, greenhouse gas emissions, and wasted labor. There isn’t a single demographic responsible for food waste, it ranges from the mom who overcooks while trying to please everyone, to the anxious millennial who prematurely discards food out of fear. 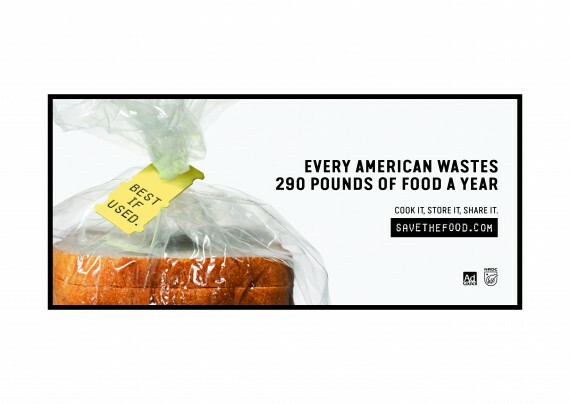 The SAVE THE FOOD campaign aims to raise awareness and change behaviors around food waste in the U.S. The integrated campaign launched on April 20th and will run for the next three years. The communications hierarchy uses Broadcast TV, Online Film, Digital Banners, pre-roll ads, press, and out-of-home to raise awareness on the issue. All communications drive traffic to savethefood.com, which provides educational information and facts on how to make meaningful change on the issue. Each piece of site content is bite-sized and shareable in social media to further spread our message. In a single weekend, the film received over 9.5 million views on Facebook. The campaign was picked up by high profile publications everywhere — National Geographic, Scientific American, Time Magazine, Fast Company, The Atlantic and more. Celebrity chefs including Tom Colicchio and Mario Batali spread the campaign via their social media channels. The film and print have sparked critical conversation about the issue of food waste all across the United States. At the time of submission, the campaign has generated over 18 million unique mentions and comments.